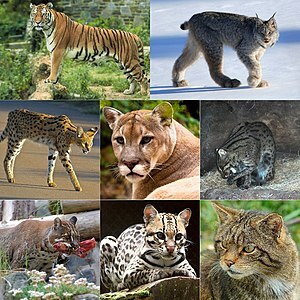 Clockwise from top left: tiger (Panthera tigris), Canadian lynx (Lynx canadensis), cougar (Puma concolor), cheetah (Acinonyx jubatus), wildcat (Felis silvestris), serval (Leptailurus serval), caracal (Caracal caracal) and ocelot (Leopardus pardalis). ↑ Salles, L. O. (1992). Felid phylogenetics: extant taxa and skull morphology (Felidae, Aeluroidea). American Museum Novitates no. 3047. ↑ "Evolutionary systematics of living Felidae – present status and current problems" (1978). Carnivore 1: 71–79. ↑ "Resolution of recent radiations within three evolutionary lineages of Felidae using mitochondrial restriction fragment length polymorphism variation" (1996). Journal of Mammalian Evolution 3 (2): 97–120. doi:10.1007/bf01454358. ↑ "Evolution of skull and mandible shape in cats (Carnivora: Felidae)" (2008). PLOS ONE 3 (7). doi:10.1371/journal.pone.0002807.